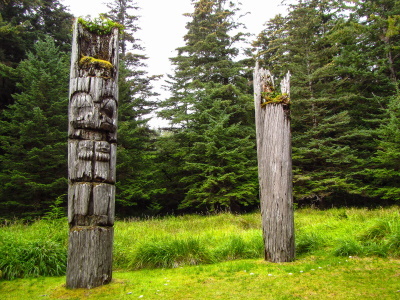 SGang Gwaay are the remains of a Haida village on the eastern side of Anthony Island, which represent an outstanding example of a traditional Northwest Coast First Nations village site, complete with standing totem poles and the remains of cedar longhouses. It was the southernmost of traditional Haida villages, being just west of and facing Kunghit Island, the southernmost island in the archipelago. Today it features the largest collection of Haida totem poles in their original locations, many celebrated as great works of art, though they are being allowed to succumb to the natural decay of the lush coastal rainforest climate. The site is extremely remote, and access is only by sea or air from towns in the northern part of the islands. SGang Gwaay was the location of several episodes in the early history of white contact with the isles. I recently went on a kayaking trip to SGaang Gwaii and found it to be an fascinating place. The old totem poles and long house were great to see as they will not be there much longer.The Hiada people believe they came from the earth and that they should return to the earth. They are located on the southern part of the Queen Charlotte Islands. I found a travel company on the internet located in the Charlottes. About the only way to get down to SGaang Qwaii is to use one of these companies as the last road is 100 miles to the north. We also stopped at Skedans an equally impressive site and should not be missed. I highly recommend going you will not be disappointed. Don't forget to ask about the hot springs. From "SGaang Gwaii (Anthony Island)" to "SGang Gwaay"
From "Anthony Island" to "SGaang Gwaii (Anthony Island)"
Masks: Among the Haida, masks were used mostly by members of the secret societies. Name changes: A series of changes which has resulted in the "extinction" of the original name - "Sgang Gwaay" started off as "Anthony Island" and offically passed through "Sgang Gwaay (Anthony Island)" before reaching its current title!